I’ve waited a long time to post a fashion blog post like today’s. A very long, long, long time. I’ve been buying some holiday outfits for Victoria throughout the last couple of weeks. We have a few parties and family functions coming up, so I wanted her to have some beautiful pieces to wear to each of them. You know, as a girl… you can’t wear the “same” thing twice – especially back to back parties! LOL, right? As a fashion blogger, I’ve always loved and appreciated easy style. I love mixing classic pieces with trendy pieces. I love mixing colors that don’t always traditionally go together. And I love finding items in my closet that I’ve had for years and wearing them again, but with a completely different look and style. I just ordered Victoria a bunch of items from OshKosh B’gosh. They have the most adorable pieces for the holiday season right now, I could’ve ordered the FULL toddler girl’s collection! Victoria really needs some staple items – sweaters, skirts, dresses and overalls. I scooped up a 3 sweaters, a pair of overalls and 2 skirts at OshKosh for Victoria. As soon as they arrived, I tore the bag opened! I fell in love with everything!! 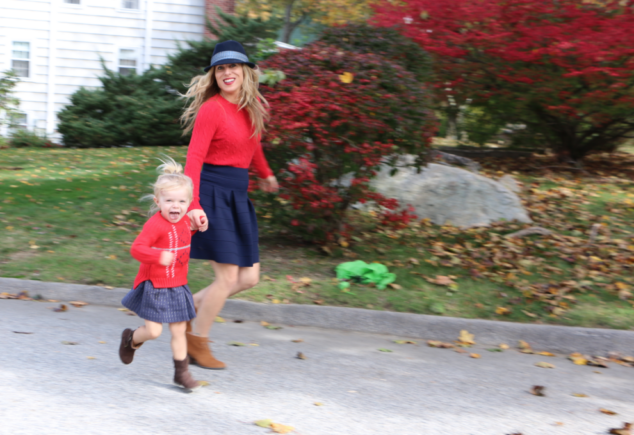 As I was putting everything away in her closet today, I realized that I pretty much had the same outfit for myself that I bought for her… so I thought it would be fun to do a Mommy and Me fashion post! She seemed game! It was a beautiful day for it!! 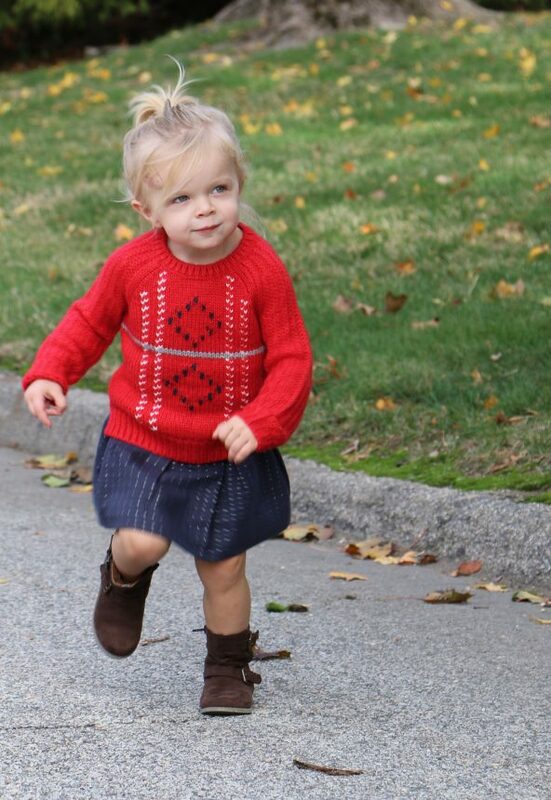 I have owned this pretty red cable knit sweater for years and years. I bought it at J.Crew so long ago, but it’s become a winter staple for me. 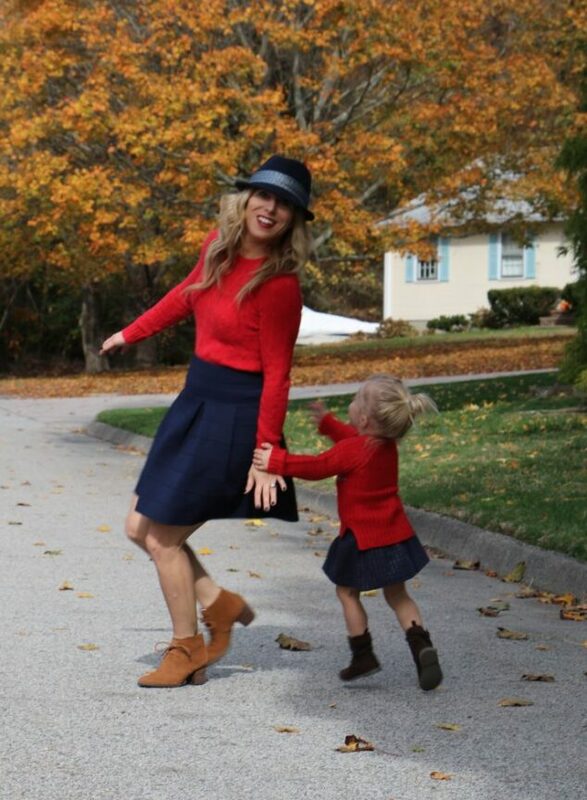 I found this navy skirt at H&M this summer… I loved the pleat and the zipper up the back! Super comfy! And my shoes! They are J.Jill staples from last Fall! I am obsessed with them, I wear them all the time!! As you can tell, we had so much fun running around and taking photos! She really is my little ray of sunshine! 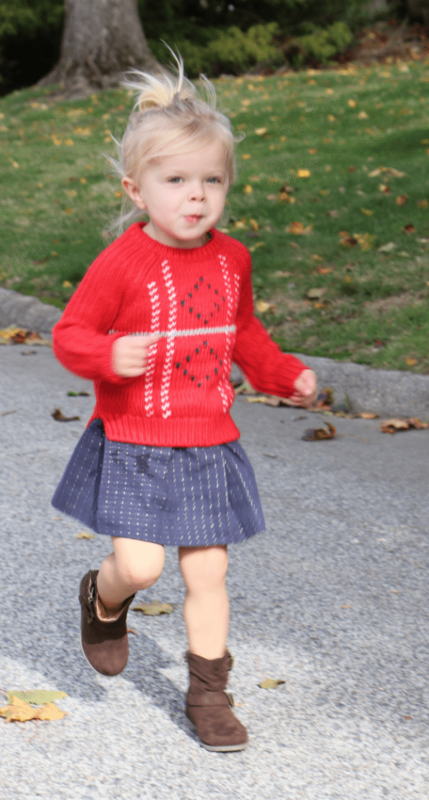 And then my little Victoria… all on her own! Happy Holiday Prep season everyone! !